Father's Day — a celebration of dads and male parenting that dates back to the early 20th century in the United States. Intended as a complement to Mother's Day, it's held annually on the third Sunday in June. When the event began, parental roles were fairly well defined. Mom tended to house and home, which involved most aspects of child rearing. Dad went out to earn a living and was called in from time to time for sound advice, permission and discipline. By the time I was born, in the early back half of the century, things hadn't changed all that much. Though my mother did have a second job out of the house, my father pretty much fit the traditional role. Self-employed, and thereby completely invested in the business, he put in 16-hour days through the week and a regular day on Saturday. The brief time he was home during the week, he was given the peace and quiet a hard-working man deserved to enjoy a meal and read the news. But when he had a moment, my young-at-heart father was the one easily convinced to stop and play. He was my sputtering motorboat ride in the lake during our week at the beach, my Father May I? games man while getting dressed for Saturday night dancing, and my singer of silly songs just about any time. Before COPD literally took the wind out of him, Dad was a beautiful dancer. I remember many a spin around the living room, my feet planted firmly atop his. My Dad — he was my first hero. On June 16 it's his, and all other hero Dads, time to be celebrated. 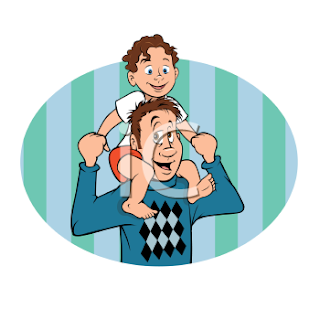 These illustrations are perfect for any special project or promotion you plan to create to honour your special man. Care for a Little Chuckle?